Here is a poem for President Elect Obama. and consider the World from your seat up on top of the mountain. Will others do the same? whose only instinct is for blood. Here’s hoping for the best in the next four years ..
I’ve been thinking about Twitter a lot lately, about the pros and cons, and I woke this morning with the lines of this poem dancing in my head. (Twitter is a network that connects people by asking them to write about what they are doing right at that moment) So I worked on it and recorded it as a podcast, sharing it out. I would love to know what the Twitter friends think about it. I found out last week that a poem I wrote during my OnPoEvMo project last year (one poem every month) garnered second place in a writing contest hosted by our Western Massachusetts Writing Project. The poem is about race and prejudice, and trying to investigate why our skin makes us feel so different from others. and, besides, your black doesn’t fit with my white. Or so I have been told, not in so many words, of course, but in so many looks. and missed opportunities that come from rage at the ways of this world. you look so different from me — on the outside. Your black doesn’t fit with my white. and then maybe — maybe — I could finally feel your light, your strength, your sense of being you. Just you and nothing more. Your black would fit with my white. and avoid the fears that keeps us rooted so firmly in our own minds. Instead, I only see skin. I have two poems to share as part of my One Poem Every Month for a Year project (which ends in November). The first one I started writing last month, as I watched my youngest son twist the corners of his favorite blanket over and over again, and the second poem I wrote just the other day. As my students were doing freewriting in the classroom, so was I and in the silence of our work, you could almost hear the echoes of stories and poems being undertaken in our minds. and tumble into the nothingness. to room to room as if it were a tail that could not come unattached. and how did he ever discover it? My tank is a bit on empty right now — it might be the slew of things I know I need to get done and get together before the start of school or it might just be that I have written myself out and need to rejuvevate the brain. Here is one I wrote as I thought about how to write a poem when you don’t have anything to write about (meta-poetry?). while the best words will have gotten away. is a complete mystery even to me. My sons and I were at a used book store this weekend and we picked up this quite large book about the history of Marvel comics. When I was my oldest son’s age (9), comics were a big part of my life. I had many, many comics, sorted by various categories, and could not get enough of these stories of flawed heroes and their adventures. 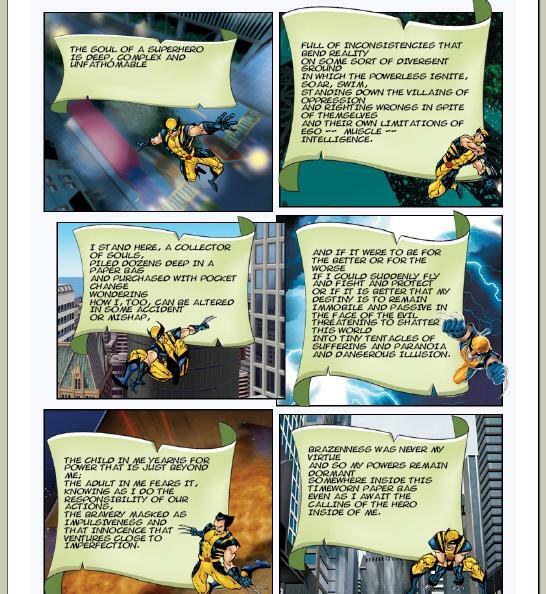 This poem for my One Poem Every Month for a Year project sprang to life as I perused the Marvel comic books and recognized many long-forgotten names and stories. that innocence that ventures close to imperfection. Did you ever have one of those days? You know, when it begins with a shattered window? Sigh. This installment of the One Poem for Every Month for a Year project is about one of my sons causing some havoc at our house. At least I can say that he gave me some writing inspiration on an otherwise uninspiring day. (Just don’t tell him that — it would leave him off the hook). is like icing on the cake. on a day designed for rest and relaxation.